The New England Multihull Association is sponsoring the third annual Gotham Multihulls Series, open to all NEMA-rated multihulls on the weekend of June 4 & 5, 2016. The Gotham has consistently attracted more multihulls than the six competing in the Louis Vuitton America’s Cup World Series, and with a dozen or more boats competing the organizers are claiming this as the largest multihull regatta in New York. The Gotham Multihulls Series features two days of PHRF racing in New York Harbor with the Statue of Liberty as a turning mark. The Saturday starting line is off Great Kills Harbor on Staten Island with a race committee supplied by the Richmond County Yacht Club. Racers are once again invited to take moorings in Great Kills Harbor on Friday night. This year the Saturday race will end near the new One°15 Brooklyn Marina, adjacent to Brooklyn Bridge Park, where multihulls will be welcomed Saturday night with a party at a nearby tap room. Sunday’s course will be determined at a skippers’ meeting Sunday morning and will again finish near the Brooklyn Bridge. Skippers returning to Connecticut and points north will be heading up the East River after the Sunday finish. Gotham Multihull Series organizers are Laurent Apollon, owner of Windsinger, a Dragonfly 800, and Andy Houlding, sailing Skedaddle, a Corsair 28R. Contact them at lapollon22@nyc.rr.com or andyhoulding@gmail.com. 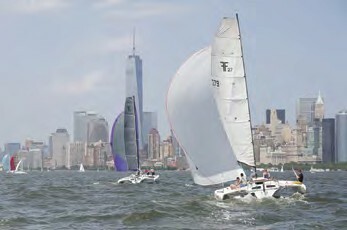 Race notices and logistical information will be posted at gothammultihulls.com and at nemasail.org. PHRF handicap ratings are available from NEMA Race Committee Chair David Lussier through the NEMA website, nemasail.org. NEMA now has an extensive racing season with 16 qualifying races from Memorial Day through October, and ranging from Falmouth, ME to Staten Island, NY. NEMA recognizes eight ocean distance races that qualify for the annual Offshore Trophy, and awards a season trophy. Many sailors trailer their folding multihulls to the race venue, while others enjoy the deliveries as much as the racing. The complete race schedule is posted at nemasail.org/racing.html.